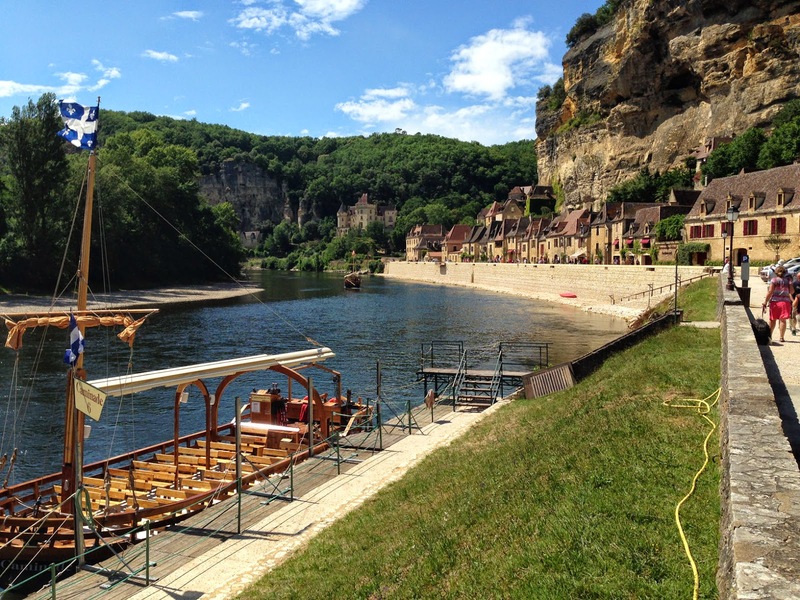 The Dordogne in western France is truly the home of The Good Life (TGL). 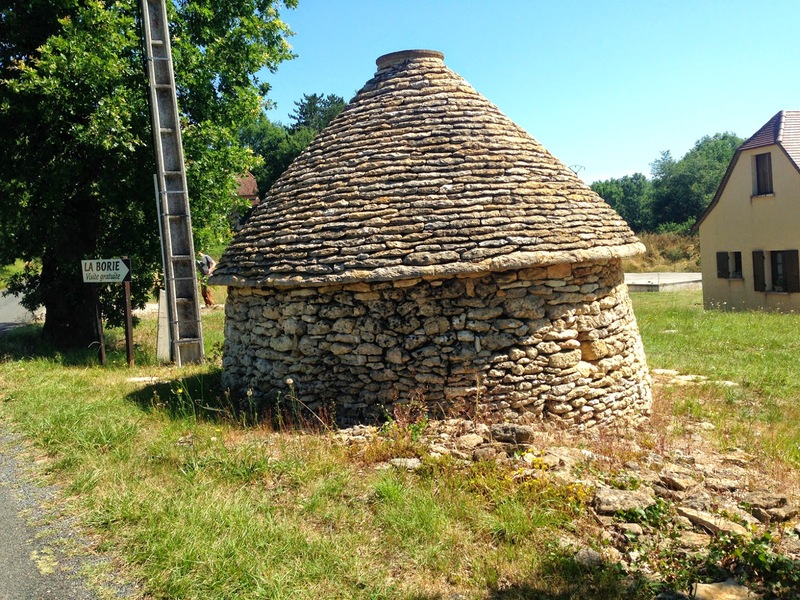 TGL starts with a few basic staples: the food and wine are wonderful, the restaurants are relaxed and affordable, there are castles on every hilltop, there are great spots to canoe and camp, and the whole area is steeped in fascinating history. 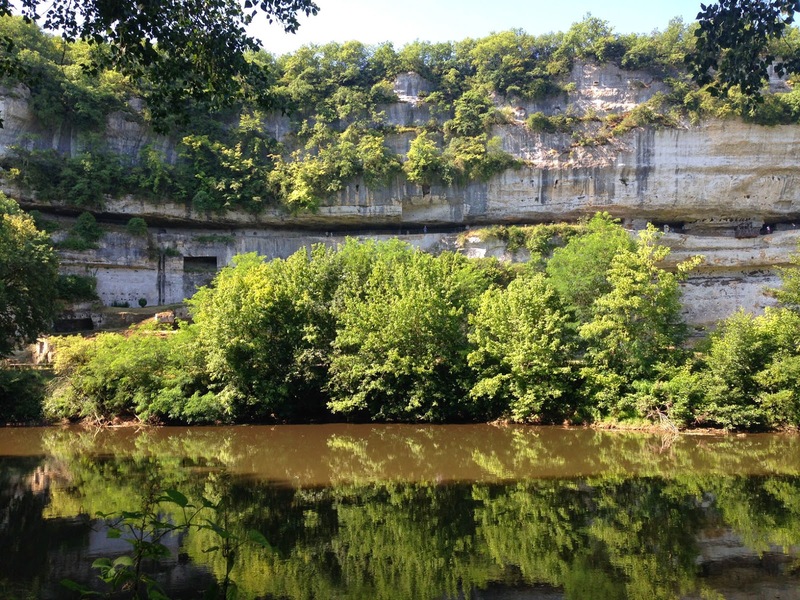 Much of what we know about prehistoric man comes from finds along the Vézère River, a tributary of the Dordogne. The whole river is lined with cliffs and caves, where people have lived since Neanderthal- and Cro-Magnon-days, leaving behind beautiful cave paintings and carved utensils. The Lascaux cave paintings are just up the river. There are still houses lining the cliff-faces where people live to this day. It's also a great area for running and mountain biking. 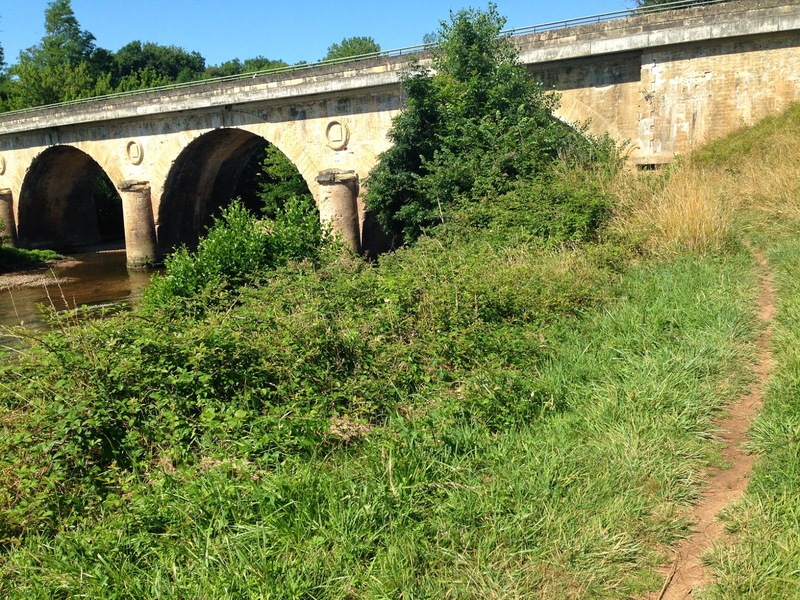 Here's a route that takes you along the Vézère at one of its most interesting spots, without any car traffic close by. 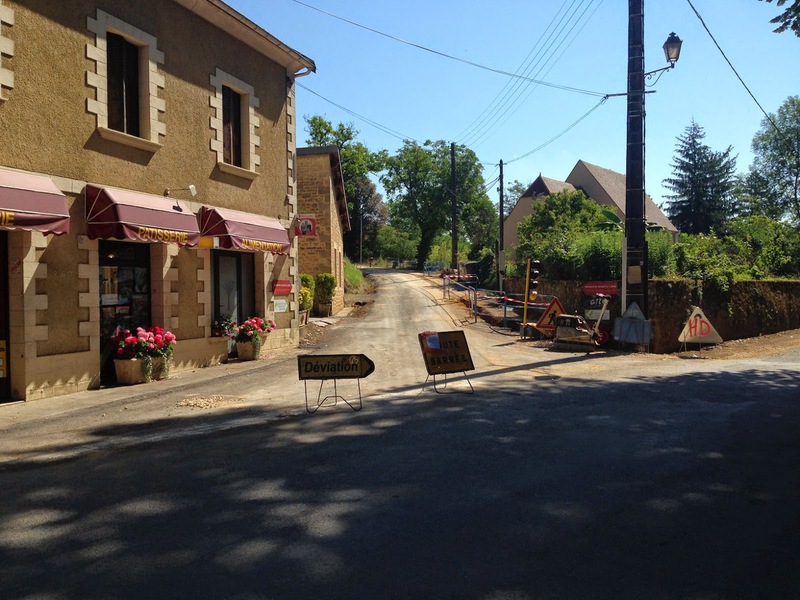 It starts near St. Leon, a village about half-way between the somewhat bigger towns of Les Eysies and Montinac. It actually starts at Le Paradis campground, which is where I was staying, and is the most wonderful place to stay in the area (with its botanic-garden-like landscaping). So go to the canoe dock right on the river, in the middle of the campground, and turn south to follow the little river trail between the campground huts and the water. Soon, you'll be out of the campground and running along farm fields to your right. It's nice and quiet here, just us and the path. The river is a slow-moving, pleasant river, lined by woods, fields and castles. After 1.5-kilometers, the river will curve to the right, as the cliffs on the other side rise above the fields. Now run through the little woods and past the canoe let-in spot. Right across the river you'll now see the impressive site of St. Christophe, a cliff village that was the home of people from prehistoric days (17,000 years ago) till just a few generations ago). You can see the ledges within the cliffs where people built their stone houses, and the little cranes used to pull up supplies from the riverside since medieval times. You'll soon come to the stone-arched car bridge, where you run under the bridge and along the pasture on the other side. 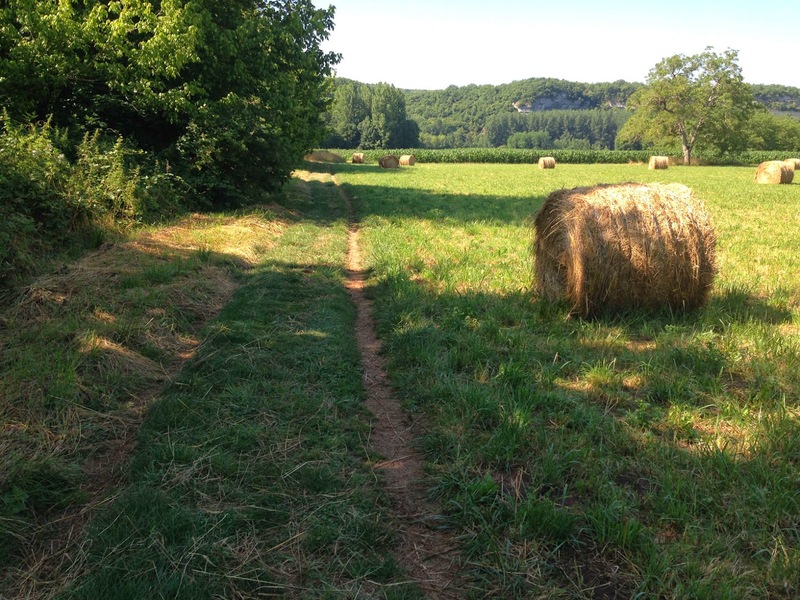 When the pasture ends, turn right and follow the trail as it heads into the little village of Moustiers. You'll hit the main (and only) street, where you turn right and run through the village for a couple of blocks, past the church. Where the side-road heads uphill, just after the grocery store, follow it. Turn left here at the store to head up the hill! You will now have a fairly long -- 800-meters -- but gentle uphill section, leaving the village and heading into the fields and woods. You'll pass a Buddhist meditation center on the left, at the top of the hill. Now continue for a few hundred meters over the gently-rolling road until you see the little round stone building on the right, in front of two houses, now used as the Buddhists' library. Turn right along the right edge of those houses, at the 4-kilometer mark, and start heading downhill directly towards the campground along an old gravel road. Turn right just before this round-house to head back to the campground! The road curves to the right as it goes by a little farmhouse. Keep to the right here, following the gravel trail down the hill. 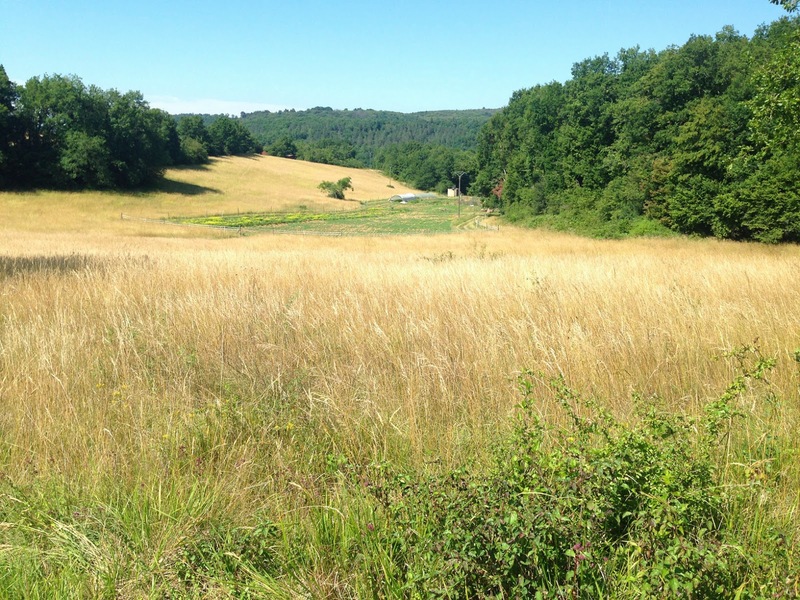 It will wind through more woods and fields until it comes out at the farm directly across the street from Le Paradis. 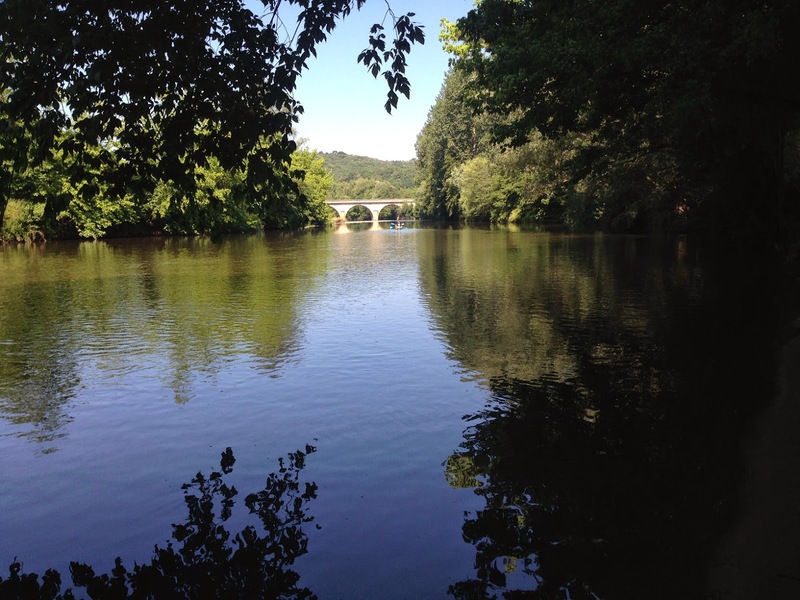 A nice little river-and-hill run in the heart of the Dordogne! And when you've taken a shower and jumped in a pool, you can head off to any of the nearby villages for a great dinner and another taste of TGL.